People oftentimes don’t understand our love for cruising. We get asked all the time why we cruise so often, and our answers are pretty much always the same. Here are a few of the things that keep us consistently cruising, and a few top reasons for why you should get on a cruise today. Let's start with before you go: Planning. Planning a cruise is an absolute breeze, because you buy your cruise package and flights and you're all set. The details and logistics are all very simple - especially if you live close to a port! Checking in and getting on the boat is quick and easy, and before you know it you’re sitting on your balcony, on a luxurious boat, sailing to a new tropical destination. And you can spend your days HOWEVER you want! That chaise lounge and margarita really never gets old, and some days you may just want to relax by the pool. Regardless, the optional activities are so organized and easy to book that you can do it months in advance or day of. Super easy. Okay this may be one of our favorites. Packing for a cruise can be whatever you want it to be: light and easy because you're living in bathing suits and tank tops OR you can go the bulky route with all of your formal night attire all of the extra room you’ll need for souvenirs. On this cruise we were planning for the heavier packing, so we made a great decision and upgraded our luggage. We got some sleek, smooth-rolling Moonlight Spinners from American Tourister. We got matching 24" bags in Marble and then a 21" bag in Rose Gold (for the extra souvenirs). These bags were super affordable, durable, and really easy to pack. (Not to mention we looked really cool wheeling them around.) ;) Check them out for your next adventure! 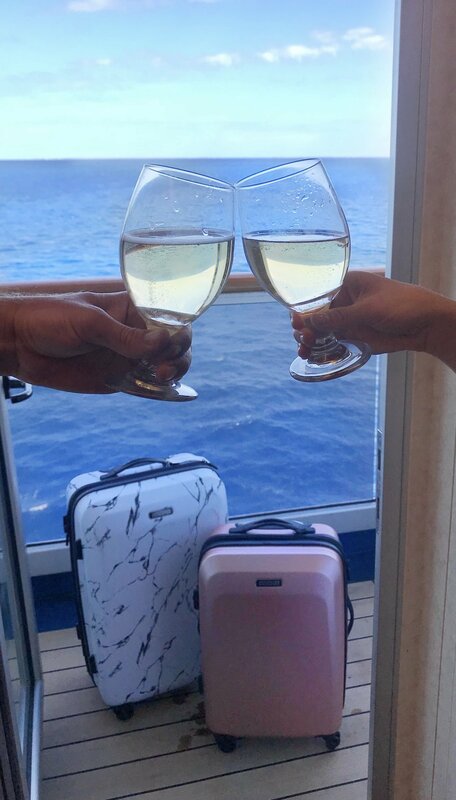 If you don't unpack your bags when you cruise, then you are really missing out! Imagine arriving at the ship rolling your Moonlight Spinners up to the door to your new home on the water for the next week. Some may walk in, drop the bags at the side of the bed, and head to the Sail Away Party or Pizza Pirate! If that's your thing... great. But here's what we do: we pop some champagne (obviously) and then leisurely unpack our bags. It's the only time we're going to unpack during this trip (as opposed to non-cruisers, who may unpack at each hotel... yuck! ), so we carefully place our things as we would in our home. We talk about all the fun things we're excited to do, agree to not judge each other for the food we consume, and cheers our champagne flutes multiple times (because… vacation!) As we finish up, we take our empty bags and together push them under the bed, where they'll remain until we leave. And just like that, the cruise has officially begun. 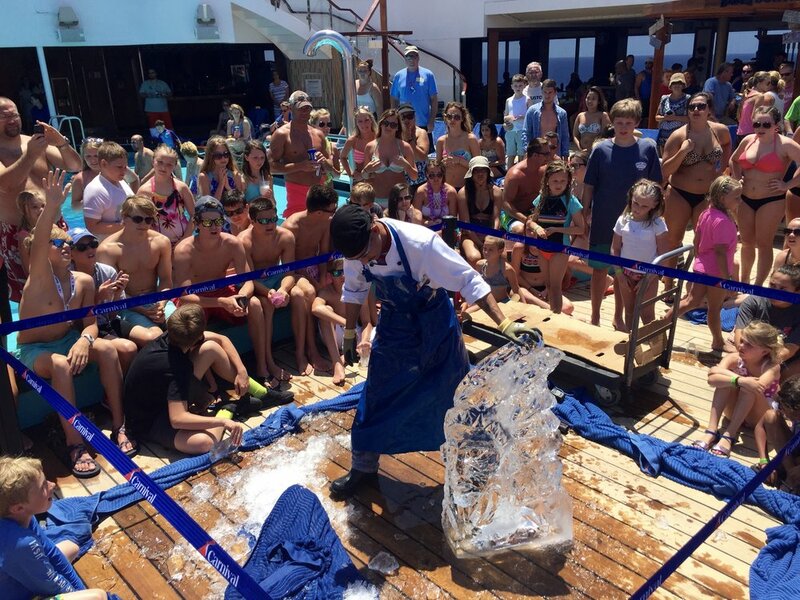 Our mouths begin to water as we anticipate our next cruise. The food is THAT good. Even after seven days at sea we leave bummed that we didn’t get to try a certain dish because the options are literally endless. 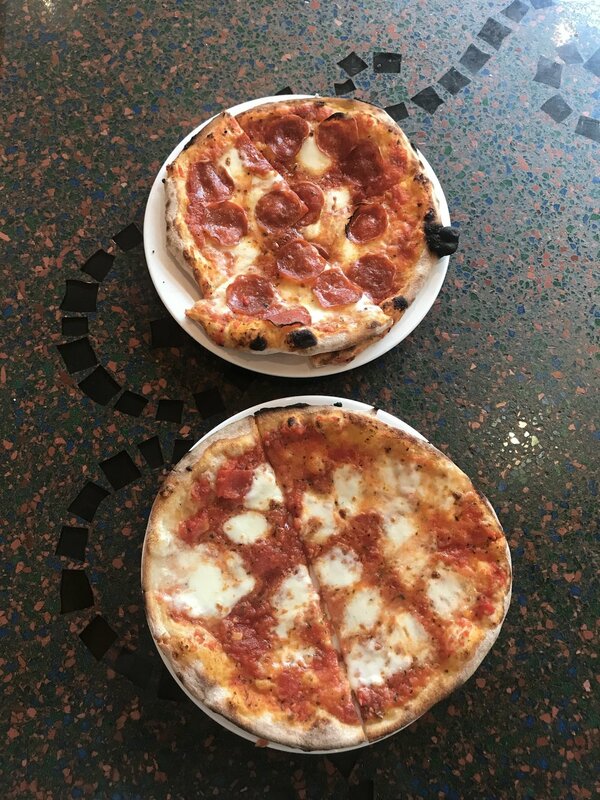 It's amazing how the staff does such an impeccable job serving up fresh, tasty, and exotic dishes day after day. It seems as though every night we’re trying something new – whether it’s escargot or a fish that’s unique to the region that we’re in! But our favorite and nightly staple has always been, and will always be, the chocolate molten lava cake on Carnival. It’s TRULY what dreams are made of. A cruise ship is like a floating city. It’s insane. Good food, bars, pools? Yep. Comedy shows, magic, dance clubs, stage shows, casinos? That's all there too. If you forgot anything in your toiletry bag or you want an extra bottle of red wine for your balcony, you can find anything nearby. Disclaimer: We cannot control how you act in the casino. If you are not there for the gambling, then we can say that cruises are really affordable! Cruising allows you to see the world, eat like royalty, and relax in style all without breaking the bank. What more could you want?! Non-cruisers may not understand this, because on a traditional vacation you get all kinds of people, most of whom probably don't want to interact with you too much. 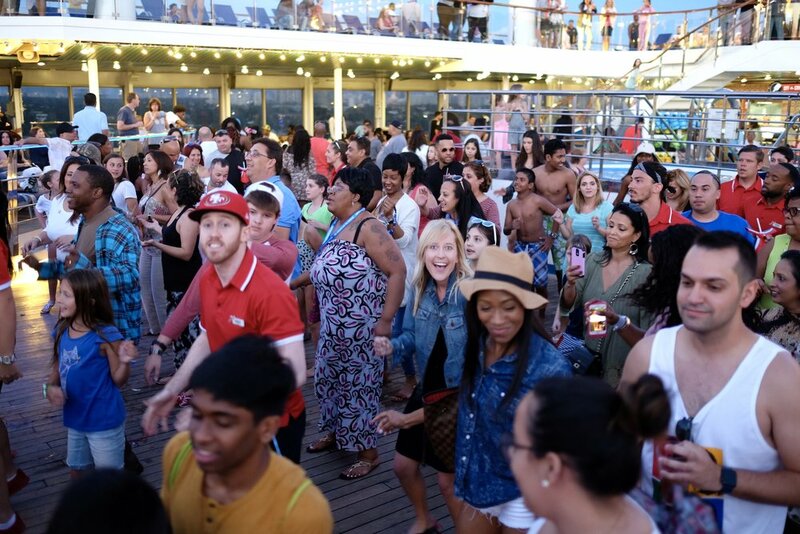 On a cruise, guests have the "Fun Never Gets Old" mentality and they are social, friendly, and of course ready to party. You'll meet so many great new friends! 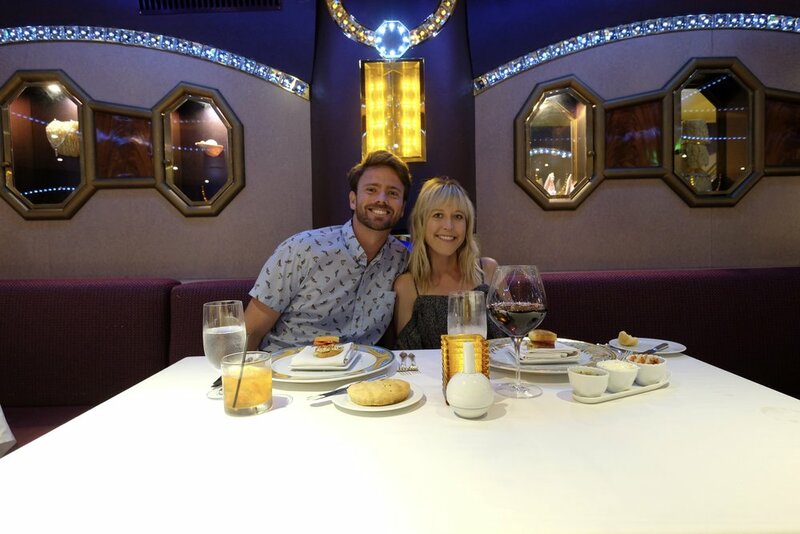 One of our favorite places is around the dinner table... you eat at the same 10 person table each night, so you totally have a little squad by the end of the trip (unless you're traveling with 8 kids). Despite how they may be in their 9-5 daily life, once people enter cruise-mode they are laid-back, fun, and potentially your new best friend! In our book, embarking on a cruise is the epitome of relaxation. Stress and obligations go out the window from the moment you step onto the ship. It’s a go-at-your-own-pace, do-what-you-want-when-you-want kind of a trip. Mid morning brunch? Sure. Drinks on the Lido deck? Why not. Afternoon bingo followed by a dip in the pool? Yes please! We love the freedom of going at our own pace when we’re on a cruise. While there are certainly no limits when it comes to daily activities, there is also no shame in taking a nap. Or three. There are 8 reasons to get you interested... need more? Shoot us an email if you're not convinced that cruise life is the best life. For everyone else... pack up your bags and let us know where your headed. We may meet you there! Special thanks to American Tourister for sponsoring this blog post!